Hello! 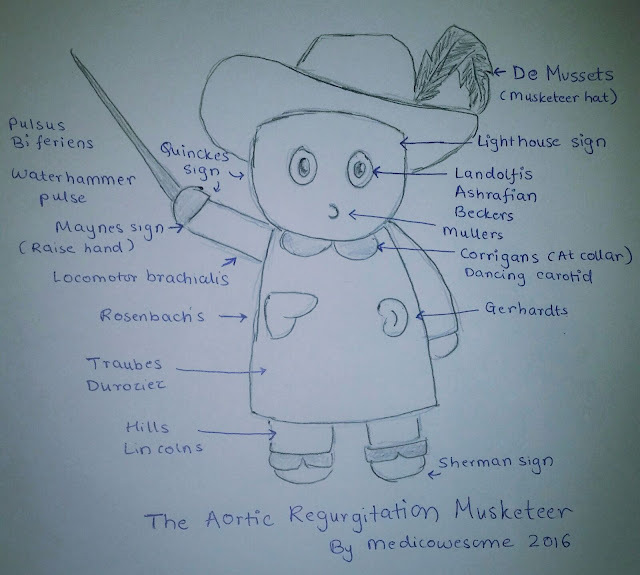 In this post, I talk about the signs seen in Aortic regurgitation and share a few mnemonics with you. I also inserted some gif images to make it fun. de Musset's sign: Rhythmic nodding or bobbing of the head in synchrony with the beating of the heart. Mnemonic: Imagine a musketeer, raising his hat and then bowing his head stylishly. Quincke's sign: Regurgitant blood flow into a dilated left ventricle during diastole leads to a decrease in diastolic pressure and a consequent increase in stroke volume, resulting in blanching and flushing, respectively, of the nail bed. PS: They are pulsations which are SEEN, they are NOT FELT. - While drawing the thumb nail sharply across the forehead, one can cause a red mark, which can be seen paling and flushing with each beat of the heart. - When pressing a glass slide on the inner part of the lower lip, the same capillary pulsation will be seen. Mnemonic: I honestly don't have a mnemonic for this one. Uhh.. How about.. "Quickly keep Quiet with Quincke's finger on your lips?" The Q's to remind you of Quincke. Finger for nail bed. Lips for the glass slide thingy. Muller sign: Systolic pulsations of uvula. Mnemonic: M for Muller, M for mouth. Muller's sign is seen in the mouth. You could also think of MU in MUller - Muller, Uvula. Watson's water hammer pulse: A pulse that is bounding and forceful, rapidly increasing and subsequently collapsing, it resembles the strike of waterhammer, a Victorian toy. Traube's sign: A 'pistol shot' systolic sound heard over the femoral artery. Mnemonic: You keep pistol (gun) in your trousers in the belt (which is near the femoral area). So pistol shot is traubes (trousers) sign which is the sound over the femoral vein. Light house sign: Alternate flushing and blanching of forehead. Mnemonic: Imagine a light house flashing lights on and off. Your forehead becomes a light house, going pale and flushed, as if lights are going on and off in your head. Gerhardt's sign: Also known as “Sailer’s sign”, in severe aortic valve regurgitation, Gerhardt’s sign is present when pulsations of the spleen are detected in the presence of splenomegaly. This is from the large forward stroke volume that is present in this state. Landolfi's sign: It is alternating dilation and constriction of the pupils in time with the patient's heartbeat. The sign is a result of the increase in pulse pressure that occurs with aortic insufficiency. Duroziez's sign: Audible diastolic murmur which can be heard over the femoral artery when it is compressed with the bell of a stethoscope. Mnemonic: D for Diastolic murmur, D for Duroziez, D for Deaf (It's audible xD). Becker's sign: Presence of visible (through an opthalmoscope) pulsation of retinal arteries. Mnemonic: BeckeR. Becker sign - Retinal artery pulsations. If you have a mnemonic for these, send em to me. Mayne's sign: Drop of at least 15 mmHg in the diastolic blood pressure on raising the arm. Rosenbach sign: The pulsation of the liver during systole caused by the high stroke volume. Hill's sign: Popliteal cuff systolic pressure exceeding brachial cuff systolic pressure by more than 10 - 20 mm Hg. Sherman sign: Dorsalis pedis pulse is quickly located and unexpectedly prominent in age >75 yr.
Locomotor brachii: Prominent pulsation of brachial artery seen in aortic regurgitation. Did you know? Dilatation of the heart with hypertrophy is called "ox-heart" in AR. I hope I get a strong letter of recommendation from my professors and get acquainted with people who will make getting Internal Medicine residency in a University Hospital easier for me. The original images I used can be viewed on tumbr though. If you have trouble viewing images / gifs, you can always use the tumblr post to view them. Click here for the tumblr post. Hey. I'm a student and these mnemonics are great. Certainly make it easier and more fun. Thanks! Hope you get that residency! Oops i didnt check the date... Hwz the progress??? Is diarrhoea really that bad? What causes thrombocytopenia in malaria? 2016 is going to be awesome, I promise.